Acacia Alcohol-FREE Liquid Extract, Organic Acacia (Acacia senegal Gum Arabic) Dried Gum Glycerite Features and description: ALCOHOL FREE! NON GMO! GLUTEN FREE! Expertly extracted Acacia ALCOHOL-FREE liquid extract! Acacia ..
Acai Alcohol-FREE Liquid Extract, Organic Acai (Euterpe Oleracea) Berries Glycerite Features and description: ALCOHOL FREE! NON GMO! GLUTEN FREE! Expertly extracted Acai berry ALCOHOL-FREE liquid extract! Acai Glycerite contains ONLY natural ingre..
Acerola Alcohol-FREE Liquid Extract, Organic Acerola (Malpighia Glabra) Dried Berry Glycerite Features and description: ALCOHOL FREE! NON GMO! GLUTEN FREE! Expertly extracted Acerola ALCOHOL-FREE liquid extract! Acerola Glycerite contains ONLY na..
Adrena Care Alcohol-FREE Herbal Liquid Extract, Adrenal Support Glycerite Features and description: ALCOHOL FREE! NON GMO! GLUTEN FREE! Highest Strength Adrena care NON-Alcohol liquid extract! Adrena Care NON-Alcohol liquid..
African Cherry Pygeum Alcohol-FREE Liquid Extract, African Cherry Pygeum (Prunus Africana) Bark Glycerite Features and description: ALCOHOL FREE! NON GMO! GLUTEN FREE! Expertly extracted, Super concentrated African Cherry Pygeum ALCOHOL-FREE liqu..
African Padauk Alcohol-FREE Liquid Extract, African Padauk (Pterocarpus Soyauxii) Dried Bark Glycerite Features and description: ALCOHOL FREE! NON GMO! GLUTEN FREE! Expertly extracted African Padauk ALCOHOL-FREE liquid extract! African Padauk Gly..
Agar Agar Alcohol-FREE Liquid Extract, Agar Agar (Gelidiella Acerosa) Dried Herb Powder Glycerite Features and description: ALCOHOL FREE! NON GMO! GLUTEN FREE! Expertly extracted Agar Agar Tincture Supplement! Agar Agar Glycerite contains ONLY na..
Agrimony Alcohol-FREE Liquid Extract, Organic Agrimony (Agrimonia Eupatoria) Glycerite Features and description: ALCOHOL FREE! NON GMO! GLUTEN FREE! Expertly extracted Agrimony ALCOHOL-FREE liquid extract! Agrimony Glycerite contains ONLY natural ..
Ai Ye Alcohol-FREE Liquid Extract, Ai Ye, Mugwort (Artemisia Vulgaris) Leaf Glycerite Features and description: ALCOHOL FREE! NON GMO! GLUTEN FREE! Expertly extracted, Super concentrated Ai Ye ALCOHOL-FREE liquid extract! Ai Ye tincture contains ..
Ailanthus Liquid Extract, Dried bark (Ailanthus Altissima) Alcohol-Free Glycerite Features and description: NON GMO! Gluten Free! We made this Ailanthus liquid extract using ONLY natural ingredients! This extract does not contain Alcohol, GMO, gl..
Ajwain Alcohol-FREE Liquid Extract, Organic Ajwain (Trachyspermum Ammi) Seeds Glycerite Features and description: ALCOHOL FREE! NON GMO! GLUTEN FREE! Expertly extracted, Highest Quality Ajwain (Trachyspermum Ammi) ALCOHOL-FREE liquid extract! Ajwa..
Akebia Liquid Extract, Dried fruit (Akebia Trifoliata) Alcohol-Free Glycerite Features and description: NON GMO! Gluten Free! We made this Akebia liquid extract using ONLY natural ingredients! This extract does not contain Alcohol, GMO, gluten, a..
Albizia Alcohol-FREE Liquid Extract, Albizia (Albizia julibrissin) Dried Flower Glycerite Features and description: ALCOHOL FREE! NON GMO! GLUTEN FREE! Expertly extracted Albizia ALCOHOL-FREE liquid extract! Albizia Glycerite contains ONLY natura..
Alfalfa Alcohol-FREE Liquid Extract, Alfalfa (Medicago Sativa) Sprouting Seeds Glycerite Features and description: ALCOHOL FREE! NON GMO! GLUTEN FREE! Expertly extracted, Super concentrated Alfalfa ALCOHOL-FREE liquid extract! 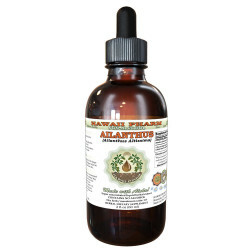 Alfalfa tincture co..
Alfalfa Alcohol-FREE Liquid Extract, Organic Alfalfa (Medicago Sativa) Dried Leaf Glycerite Features and description: ALCOHOL FREE! NON GMO! GLUTEN FREE! Alfalfa is high in protein, calcium and other minerals, vitamins in the B group, vitamin C, v..
Alkanet Alcohol-FREE Liquid Extract, Alkanet (Alkanna Tinctoria) Dried Root Glycerite Features and description: ALCOHOL FREE! NON GMO! GLUTEN FREE! Expertly extracted Alkanet ALCOHOL-FREE liquid extract! Alkanet Glycerite contains ONLY natural in..
Allspice Alcohol-FREE Liquid Extract, Organic Allspice (Pimenta Dioica) Glycerite Features and description: ALCOHOL FREE! NON GMO! GLUTEN FREE! Expertly extracted Allspice ALCOHOL-FREE liquid extract! Allspice Glycerite contains ONLY natural ingre..
Aloe Alcohol-FREE Liquid Extract, Aloe (Aloe Ferox) Dried Leaf Glycerite Features and description: ALCOHOL FREE! NON GMO! GLUTEN FREE! Expertly extracted Aloe ALCOHOL-FREE liquid extract! Aloe Glycerite contains ONLY natural ingredients! Alcohol ..
Aloe Vera Alcohol-FREE Liquid Extract, Organic Aloe Vera (Aloe Vera ) Dried Leaf Glycerite Features and description: ALCOHOL FREE! NON GMO! GLUTEN FREE! Expertly extracted Aloe vera ALCOHOL-FREE liquid extract! Aloe Vera Glycerite contains ONLY na..
American Ginseng Alcohol-FREE Liquid Extract, Ginseng (Panax Quinquefolius) Dried Root Glycerite Features and description: ALCOHOL FREE! NON GMO! GLUTEN FREE! Expertly extracted American Ginseng ALCOHOL-FREE liquid extract! American Ginseng Glyce..
American Silvertop Alcohol-FREE Liquid Extract, American Silvertop (Glehnia Littoralis) Dried Root Glycerite Features and description: ALCOHOL FREE! NON GMO! GLUTEN FREE! Expertly extracted American Silvertop ALCOHOL-FREE liquid extract! American..
Amla Alcohol-FREE Liquid Extract, Organic Amla (Emblica Officinalis) Glycerite Features and description: ALCOHOL FREE! NON GMO! GLUTEN FREE! Expertly extracted Amla ALCOHOL-FREE liquid extract! Amla is good source of vitamin C, amino acids, and mi..
Anamu Alcohol-FREE Liquid Extract, Anamu (Petiveria Alliacea) Dried Herb Powder Glycerite Features and description: ALCOHOL FREE! NON GMO! GLUTEN FREE! Expertly extracted Anamu Tincture Supplement! Anamu Glycerite contains ONLY natural ingredient..
Angelica Alcohol-FREE Liquid Extract, Organic Angelica (Angelica archangelica) Dried Root Glycerite Features and description: ALCOHOL FREE! NON GMO! GLUTEN FREE! Expertly extracted Angelica ALCOHOL-FREE liquid extract! Angelica Glycerite contains ..
Angelica Chinese Alcohol-FREE Liquid Extract, Organic Angelica (Angelica Sinensis) Dried Root Glycerite Features and description: ALCOHOL FREE! NON GMO! GLUTEN FREE! Expertly extracted Chinese Angelica ALCOHOL-FREE liquid extract! Chinese Angelica..
Anise Alcohol-FREE Liquid Extract, Organic Anise (Pimpinella Anisum) Seed Glycerite Features and description: ALCOHOL FREE! NON GMO! GLUTEN FREE! Expertly extracted Anise ALCOHOL-FREE liquid extract! Anise Glycerite contains ONLY natural ingredien..
Anise Star Alcohol-FREE Liquid Extract, Organic Anise star (Illicium verum) Glycerite Features and description: ALCOHOL FREE! NON GMO! GLUTEN FREE! Expertly extracted Anise Star ALCOHOL-FREE liquid extract! Anise Star Glycerite contains ONLY natur..
Annatto Alcohol-FREE Liquid Extract, Organic Annatto (Bixa Orellana) Dried Seed Glycerite Features and description: ALCOHOL FREE! NON GMO! GLUTEN FREE! Expertly extracted Annatto ALCOHOL-FREE liquid extract! Annatto Glycerite contains ONLY natura..
Anxiety Care Alcohol-FREE Herbal Liquid Extract, Borage Herb, St. John's Wort Tops, Hawthorn Berry, Oat tops and Skullcap Herb Glycerite Features and description: ALCOHOL FREE! NON GMO! GLUTEN FREE! Highest Strength Anxie..
Anxiety Relief Alcohol-FREE Herbal Liquid Extract, Lemon Balm Dried Leaf, Valerian Dried Root, Saint John's Wort Dried Herb Glycerite Features and description: ALCOHOL FREE! NON GMO! GLUTEN FREE! Highest Strength Anxiety ..
Anxiety Remedy Alcohol-FREE Herbal Liquid Extract, Kava Kava Dried Root, Valerian Dried Root, Passion Flower Dried Leaf Glycerite Features and description: ALCOHOL FREE! NON GMO! GLUTEN FREE! Highest Strength Anxiety Remedy N..
Arctic Poppy Alcohol-FREE Liquid Extract, Arctic Poppy (Papaver Radicatum) Herb Glycerite Features and description: ALCOHOL FREE! NON GMO! GLUTEN FREE! Expertly extracted, Super concentrated Arctic Poppy ALCOHOL-FREE liquid extract! Arctic Poppy ..
Arisaema Liquid Extract, Dried rhizome (Arisaema Amurense) Alcohol-Free Glycerite Features and description: NON GMO! Gluten Free! We made this Arisaema liquid extract using ONLY natural ingredients! This extract does not contain Alcohol, GMO, glu..
Arjuna Alcohol-FREE Liquid Extract, Organic Arjuna (Terminalia Arjuna) Dried Bark Glycerite Features and description: ALCOHOL FREE! NON GMO! GLUTEN FREE! Expertly extracted Arjuna ALCOHOL-FREE liquid extract! Arjuna Glycerite contains ONLY natura..
Arnica Alcohol-FREE Liquid Extract, Organic Arnica (Arnica Montana) Dried Flower Glycerite Features and description: ALCOHOL FREE! NON GMO! GLUTEN FREE! Expertly extracted Arnica ALCOHOL-FREE liquid extract! Arnica Glycerite contains ONLY natural ..
Aroma Resins Alcohol-FREE Herbal Liquid Extract, Opopanax, Copal, Frankincense, Myrrh Gum and Dragons Blood Glycerite Features and description: ALCOHOL FREE! NON GMO! GLUTEN FREE! Highest Strength Aroma Resins (Opopanax, Copal, Frankincense, Myrrh..
Arrow Root Alcohol-FREE Liquid Extract, Arrow Root (Maranta Arundinacea) Dried Root Glycerite Features and description: ALCOHOL FREE! NON GMO! GLUTEN FREE! Expertly extracted Arrowroot ALCOHOL-FREE liquid extract! Arrowroot Glycerite contains ONL..
Artichoke Alcohol-FREE Liquid Extract, Organic Artichoke (Cynara scolymus) Dried Leaf Glycerite Features and description: ALCOHOL FREE! NON GMO! GLUTEN FREE! Expertly extracted Artichoke ALCOHOL-FREE liquid extract! Artichoke Glycerite contains ON..
Asafoetida Alcohol-FREE Liquid Extract, Organic Asafoetida (Ferula Assa-foetida) Dried Herb Powder Glycerite Features and description: ALCOHOL FREE! NON GMO! GLUTEN FREE! Expertly extracted Asafoetida ALCOHOL-FREE liquid extract! Asafoetida Glyce..
Ashwagandha Alcohol-FREE Liquid Extract, Organic Ashwagandha (Withania Somnifera) Dried Root Glycerite Features and description: ALCOHOL FREE! NON GMO! GLUTEN FREE! Expertly extracted, Highest Quality Ashwagandha root ALCOHOL-FREE liquid extract! ..
Astragalus Alcohol-FREE Liquid Extract, Organic Astragalus (Astragalus membranaceus) Dried Root Glycerite Features and description: ALCOHOL FREE! NON GMO! GLUTEN FREE! Expertly extracted Astragalus ALCOHOL-FREE liquid extract! Astragalus G..
Aveloz Alcohol-FREE Liquid Extract, Aveloz (Euphorbia Tirucalli) Dried Stem Glycerite Features and description: ALCOHOL FREE! NON GMO! GLUTEN FREE! Expertly extracted Aveloz ALCOHOL-FREE liquid extract! Aveloz Glycerite contains ONLY natu..
Avocado Alcohol-FREE Liquid Extract, Avocado (Persea Americana) Dried Seeds Glycerite Features and description: ALCOHOL FREE! NON GMO! GLUTEN FREE! Expertly extracted Avocado ALCOHOL-FREE liquid extract! Avocado Glycerite contains ONLY natural in..